Sheffield FC boss Gavin Smith insists his side must show more consistency if they are to move into the top six of the Evo-Stik East Division. Club – who host newly formed big spenders Ossett United on Saturday – triumphed 3-2 at Frickley Athletic on Tuesday having lost to struggling Spalding United last weekend. And Smith says his side must maintain a strong level of performance no matter the opposition. “We need to be more consistent,” he said. “It's no good us playing well against the top teams then slipping up against sides near the bottom. “We beat a very good and strong Frickley side where we played really well and should have scored more, having been really poor in the previous game when we lost at Spalding who were bottom of the table. “I think that highlights how inconsistent we have been. “You have to keep your standards up against whoever you’re playing. “Sometimes we've not started well in games which gives you a ladder to climb. “You can’t perform for 60 minutes and expect to win football games. You have to do it for 90 minutes plus and that's what we keep drilling into the players. “If you come off the pitch having put the effort in for 90 minutes but you’ve been beaten by a better side then that's fine. 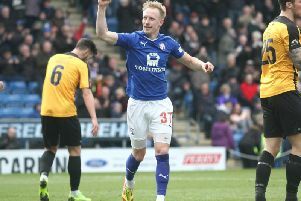 Smith – whose side can move into the top six with a win this weekend – is confident his side can mount a promotion push in the second half of the season. “Everyone is taking points off each other so if we can go on a little run we can be up there,” he said. “We've shown when we’re on our game what we’re capable of. "We’ll take one game at a time, starting with Ossett. Tyreece Robinson and on loan Matt Downing are ruled out with injury as Ossett arrive four places but just one point better off than Club in 11th. Stocksbridge Park Steels boss Chris Hilton his confident his side will turn things around ahead of tomorrow’s crucial home clash against Wisbech Town. Steels are without a win in the last five games which sees them down in 17th – one place behind the visitors with just goal difference separating the two teams. “It’s an important game because we need a win, irrespective of who we are playing,” said Hilton. “I’m confident we’ve got enough in the dressing to climb up the table. “The work effort in recent games has been good. “We’ve been creating chances but we need to stick the ball in the net. We’ve got players in the team that can do that. “We’re not panicking at the moment. I believe the side is too good to be in this position but we’ve got to go out and show that and make sure we get over the the line. Steels have picked up just one point from the last 15 available but Hilton feels if they repeat the form they showed in the 1-0 defeat at Markse United in the last outing, they should come away with the win against Wisbech. “We played really well against a team second in the table and more than matched them all over the pitch,” he said. Defender Todd Jordan (injury) and winger Tyler Williams (suspension) are both out.